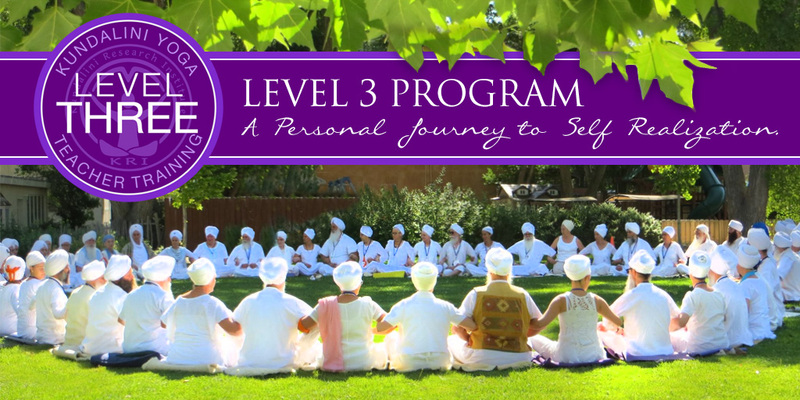 In this third and final level that Yogi Bhajan gave, we refine our authentic identity as a Teacher and deepen our unique relationship to the Sacred. The KRI Level Three program is a personal journey to self-realization. It completes the Aquarian Teacher Training by cultivating our true identity as teachers through meditative experience, spiritual maturity and serving others. The foundational elements of Level Three take place over 1,000 days. In this time, one commits to developing a deep meditative practice through personal and group meditation, meeting regularly with their peer group to give and receive support, and creating a Seva Legacy project comprised of their life’s passion and service. Additionally, one commits to attending the Mela, a gathering for Level Three participants to be and share together in person. All of which contributes to one’s development as a Teacher. Read more about the Level Three program in the tabs below. Section A: TEACHING and CERTIFICATIONS – All are required. In compliance with the current Code of Ethics & Professional Standards of a Kundalini Yoga Teacher and conduct yourself in accordance with the highest professional standards. Section B: PERSONAL PRACTICE – Need to have fulfilled a minimum of TWO practices below. Option 2: ONE item from Meditation & Personal Practice and ONE item from Community Service. A physical exercise Kriya in Kundalini Yoga as taught by Yogi Bhajan ® (60 min+) -- 40 Days. 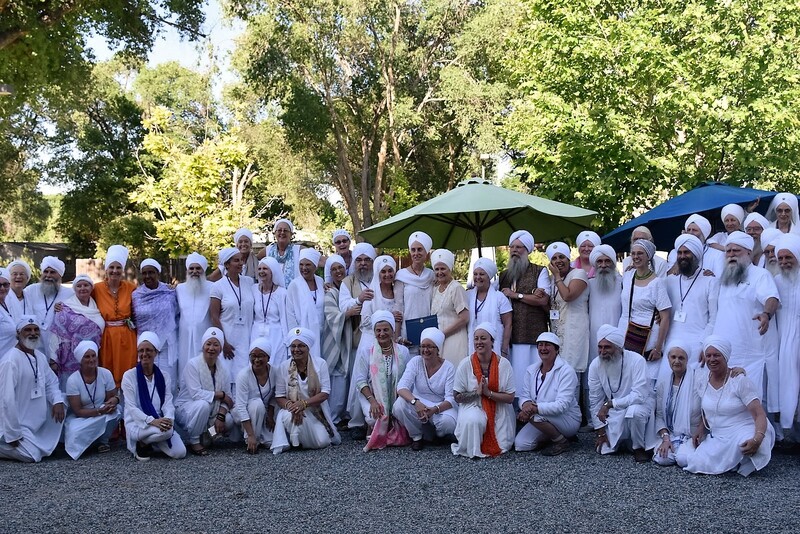 Personally attended 40 of Yogi Bhajan’s classes or watched 40 Yogi Bhajan videos with consciousness of a student. Organized community potlucks, Full Moon Meditations etc. The program focuses on the three qualities of a Spiritual Teacher: Spiritual Maturity, Meditative Mind and Seva. These qualities are intended to be cultivated and interwoven in all three levels of teacher training. However, it is in Level Three that we experience their integration. To receive a Level Three certificate, one will need to complete the requirements for each of these three qualities. Goal: To develop an authentic and fully integrated presence as Teacher, achieved through self-reflection, spiritual lifestyle practices and peer dialogue support. The ability to penetrate through presence. Well cultivated wisdom (beyond knowledge or intellect). Humility - recognition that God is the doer. Living a spiritually conscious life in alignment with the “The 16 Facets of Perfection of a Kundalini Yoga Teacher. Maintaining a spiritual discipline in service of our Isht (sacredness). Balance of Shakti and Bhakti. Obeying the Laws of Deliverance and Sustenance as a Teacher. Practice of love, kindness, compassion, and seeing God in all. A recognition that we are continually growing and ever evolving. Participate in Annual Kundalini Yoga Mela: A Level Three Experience. 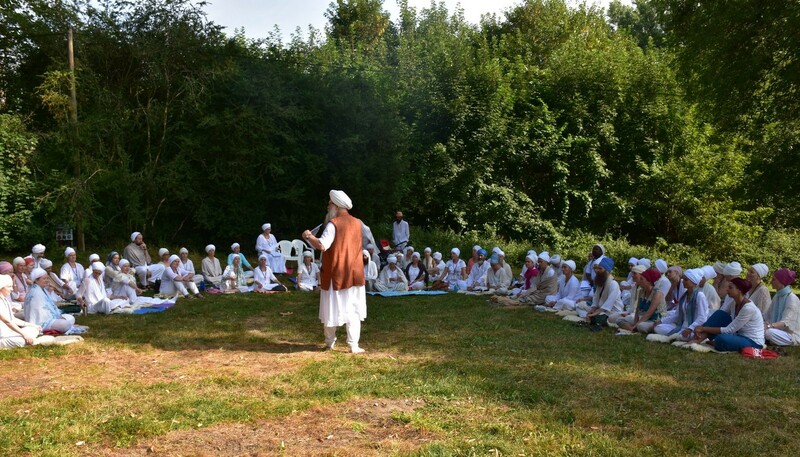 Attendance in three of the four Melas within the 1000-day experience; this includes the Opening/Orientation and Closing/Graduating Melas, as well as a third Mela during the 1000-day experience. You will choose one location and attend the Melas at that location. Melas are held during the summer once a year in Espanola, NM and Europe. Participate in Peer Dialogue Sessions. The Peer Dialogue Process is a structured framework for small group dialogue that fosters an environment of safety and trust that allows each person to both receive from and contribute to the discussion. The Peer Group takes on the role of supporting individual participants through their process. While a recommended structure and guidelines for Peer Dialogue are provided, the Peer groups are self-run and self-sustaining. They are the heart of the Level Three process. Apply, share and integrate Level Three concepts into your teaching. As participants in the Level Three program you are expected to reflect on these concepts, utilize them in your teaching and report back each year on your experiences during the 1000-day Level Three program. Ways you might integrate and share Level Three concepts, include but are not limited to workshops, community-building gatherings and seva experiences. In this way, participants have an opportunity to apply the experience of Level Three consciousness into their role and identity as Teachers as well as seeding these guiding principles within their students and the greater community. Goal: To cultivate and refine one’s meditative mind, as achieved through focused application of specific Kundalini Yoga and Meditation practices. Leading to a continuous presence of consciousness. Note: These additional course options do not have to be pre-approved by KRI. Rather, one’s peer group may assist the candidate in determining whether a course or workshop meets the above eligibility criteria. At least one of the above courses needs to be for 3 consecutive days. Up to six days of group meditation completed prior to entering Level Three may be used to fulfill the Level Three Meditative Mind requirements, as long as they were taken after completion of Level One Teacher Training. Level Two courses do not count since they are a pre-requisite for the L3 program. Goal: To deepen an ongoing attitude of Seva, or Selfless Service. To align individual passion, purpose and destiny to build and serve community. Carried out either individually or as part of a group (provided each individual contributes to the project). Documented and presented to Level Three peers in a Seva/Legacy Project Report. (Presentation can be done in a mode of one’s choice: video, PowerPoint, webcam, etc). Self-Reflection: Reflect on and discuss in Peer Group (your choice of Seva/Legacy Project, as well as, a series of questions regarding your attitude toward seva. KRI is not here to say whether an individual is Teacher, as defined by Yogi Bhajan in the Master’s Touch. Each individual must initiate themselves by recognizing and bowing to the Teacher within. Level Three then provides a pathway of practice and self-reflection designed to cultivate the qualities of the Teacher. This provides an opportunity of self-realization where you can qualify yourself and be recognized by peers as a Teacher. Yogi Bhajan’s stated the Aquarian Teacher Trainer Program be a three level training which would “stand up in a court of law”. 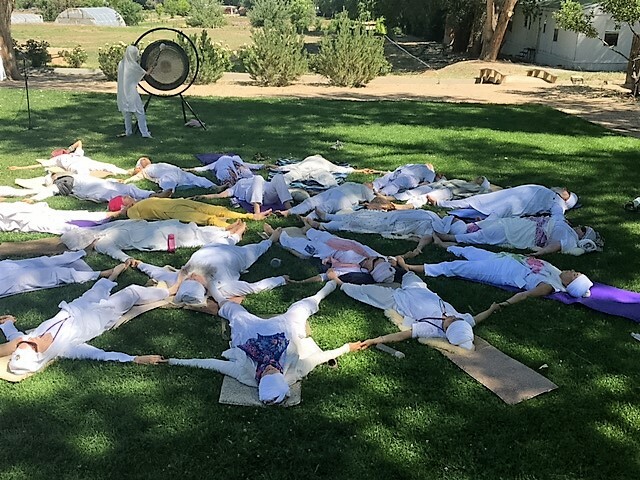 Followed the pathway laid out in the Teachings of Yogi Bhajan within the framework of the Aquarian Teacher Training Program which has been designed to provide an individual the opportunity to develop a his/her consciousness and caliber so that a Teacher can emerge. Publically committed to living the Code of Excellence and embodying the Sixteen Facets of a Teacher. In Level One and Two your program’s Lead Trainer certified you had fulfilled all the requirements. Level Three is more than a three year program. It is our life’s work, polishing our gemlike selves. We continue to grow and awaken our souls to the realization that we are ONE so that we may serve humanity as lighthouses and forklifts. Part of building the Level Three culture and community of teachers and peers who represent a communal link in the Golden Chain, each Level Three generation of graduates will welcome, support and hand-off to the next generation. Therefore, as a condition for graduation, you are required to commit to participate in at least ONE additional Mela within three years POST graduation. This will help insure the growth of our Level Three community and maintain the sustainability of the Level Three process for future generations.